Internal Recycling containers can be provided for you to conveniently locate them where the cardboard waste is generated. These can then be emptied as frequently as required into the external recycling container provided. 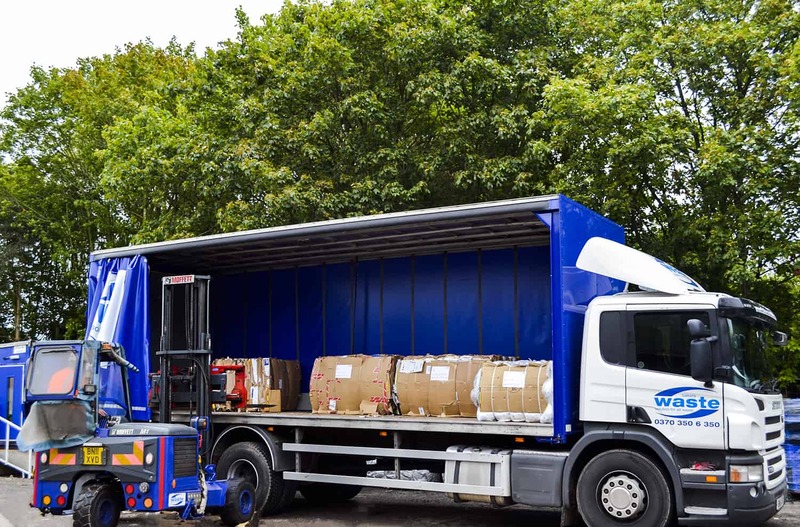 We collect paper and cardboard in a variety of external containers including wheelie bins, front end loaders and roll on roll offs. We can also supply balers. This will enable you bale the material yourself and possibly receive a rebate! Bakers Waste have been recycling cardboard for many years. Cardboard waste is collected for recycling using various containers. Depending on volume and access we can supply regular small collections or larger periodic collections. There it is recycled into new products, like packaging, boxes, egg boxes, etc. For enquiries about our Leicestershire and Northamptonshire cardboard and paper recycling service, please call us on: 0370 350 6 350. Want to book our cardboard recycling service for your business? Get in touch! Call us today on 0370 350 6 350 to discuss your cardboard recycling requirements or alternatively send us a message via the form below and a member of our team will respond to your enquiry.